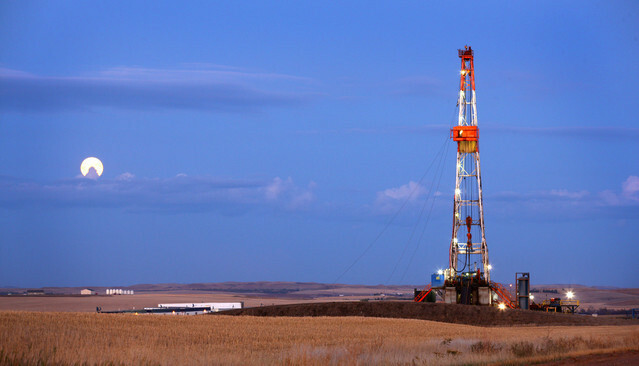 An oil drilling rig stands on the Bakken formation in North Dakota, U.S. North Dakota’s Bakken is the center of that boom. Photographer: Matthew Staver/Bloomberg An oil drilling rig stands on the Bakken formation in North Dakota, U.S. North Dakota’s Bakken is the center of that boom. A tripling of natural-gas production from unconventional sources, such as shale formations, will only happen if environmental concerns are addressed, according to the International Energy Agency. Annual extraction from unconventional resources may rise to 1.6 trillion cubic meters in 2035 to account for 32 percent of all gas production, up from 14 percent this year, the IEA said in an e-mailed report released today. That figure will only be reached if companies and regulators are transparent, monitor environmental impacts and take the concerns of local communities seriously, according to the report. Hydraulic fracturing, or fracking, the practice of pumping water, sand and chemicals into wells to extract gas from hard- to-exploit shale rock, helped the U.S. overtake Russia as the world’s biggest producer of the fuel. The global potential of shale resources has been stymied after France and Bulgaria banned the practice and activity was suspended in the U.K.
More than 20 towns in New York state have adopted laws to ban drilling, according to Karen Edelstein, a geographic information-systems consultant in Ithaca, New York. Following best-practice guidelines as proposed by the IEA will add about 7 percent to production costs, the organization said in the report. That will still leave “healthy revenues” for investors, Birol said. Greenpeace said in an e-mailed statement today that the IEA’s report doesn’t sufficiently evaluate the climatic implications of its guidelines. Birol said in London today that U.S. gas prices aren’t sustainable and need to rise to about $4.50 per million British thermal units. Prices have slumped as much as 62 percent in the past year as unconventional output rose. The June contract traded at $2.502 per million Btu today after falling to a 10- year low of $1.902 on April 19. Increased shale production will bring about a global golden age of gas, pushing down prices and increasing demand by more than 50 percent from 2010 levels by 2035, when its share of the energy mix will have risen to 25 percent from less than 21 percent, the IEA said. European gas usage will remain about the same and increased production from shale, led by Poland, will make up for a decline in conventional sources in the North Sea and elsewhere in the continent after 2020, according to the report. Prices will decline in Europe as existing suppliers, such as Russia and Norway, are forced to compete for market share, the IEA said. “From the geopolitics point of view, the U.S., China and Australia emerging as major gas producers means more diversification, which is good news for the energy security of Europe,” Birol said. In April 2011, the U.S. Energy Department’s Energy Information Administration said that China has 1,275 trillion cubic feet of recoverable shale gas, almost 50 percent more than that held by the U.S., and that Poland has 187 trillion cubic feet. Since then, shale development in China has been slower than predicted by the government. The Polish Geological Institute said in March that reserves in the eastern European nation may be as much as 85 percent less than the EIA’s estimates. The cost of drilling in Poland is three times that in the U.S., Schlumberger Ltd. (SLB) (SLB) said in November. Technological hurdles to the exploitation of shale gas outside of the U.S. will be overcome, Birol said yesterday.